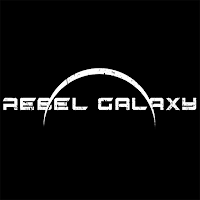 List of all available Spaceships in Rebel Galaxy. This walkthrough includes stats, price credits, details and it's multiple stations. 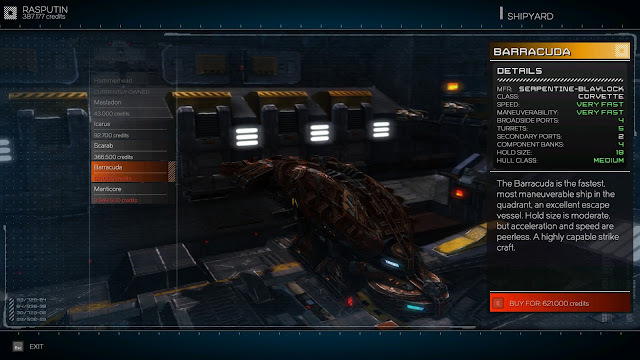 Select the Spaceship Type to get the details and description. 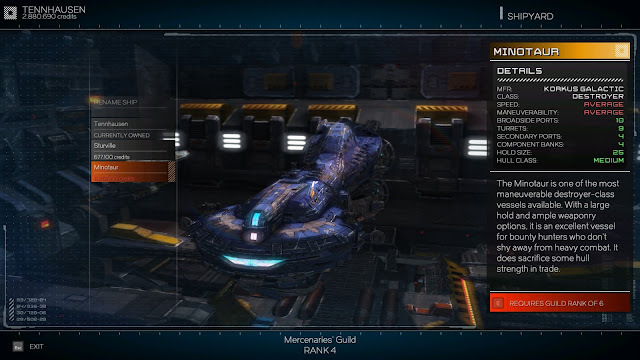 Merchant Guild Members have access to ships based on their guild rank. 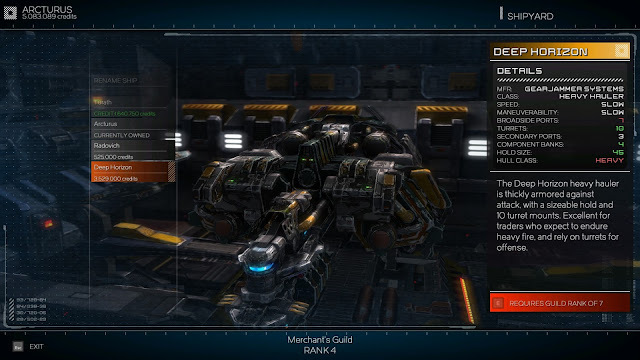 Wanna be mercenaries can access ships based on their guild rank. 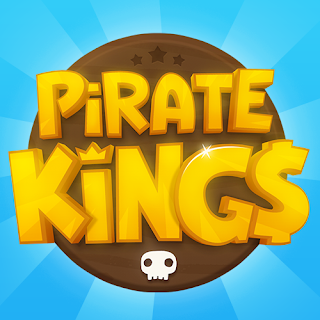 A favorite of mercenaries and pirates alike. 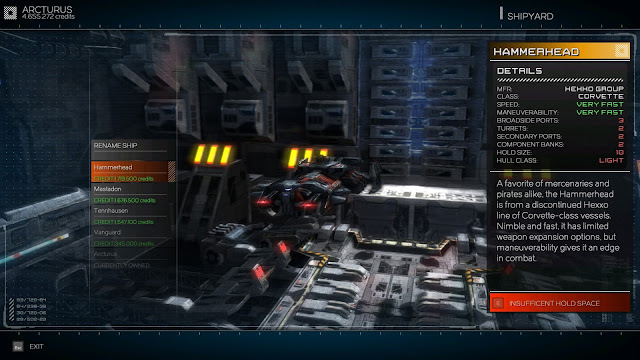 The Hammerhead is from a discontinued Hexxo line of Corvette-class vessels. Nimble and fast, it has limited weapon expansion options. 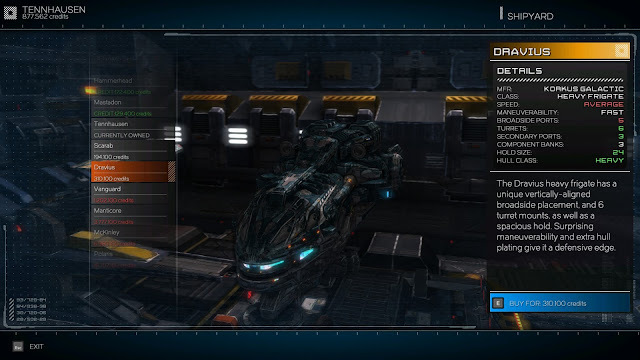 But maneuverability gives it edge in combat. 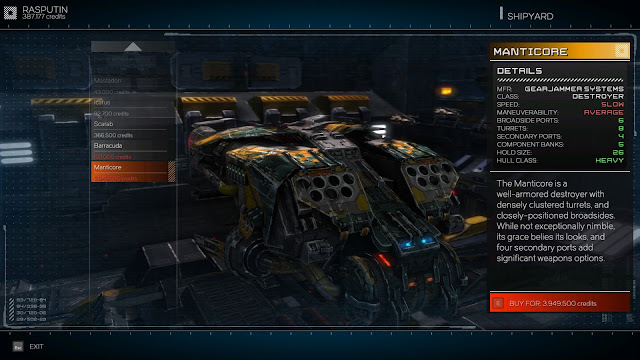 The Mastadon is the consumer version of popular militia frigate. 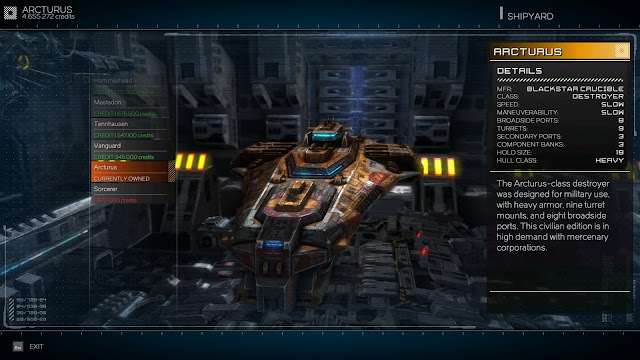 It features 4 broadside mounts, 2 secondary ports and 3 independent turrets. The Tennhausen has become a standard for military enforcement and the consumer class vessel is valued for its remarkable combat agility and expanded broadside capabilities. 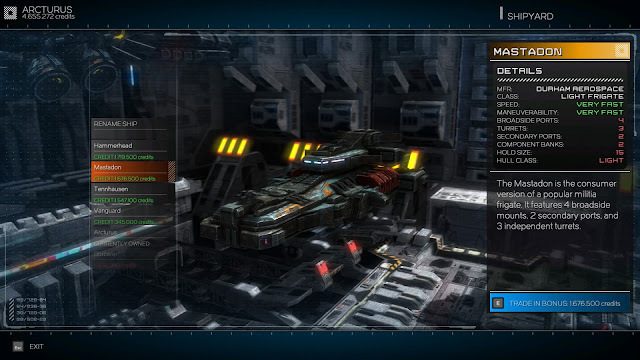 The Scarab is a turret-focused light frigate with 7 mounts, but a meager 3 broadside ports. 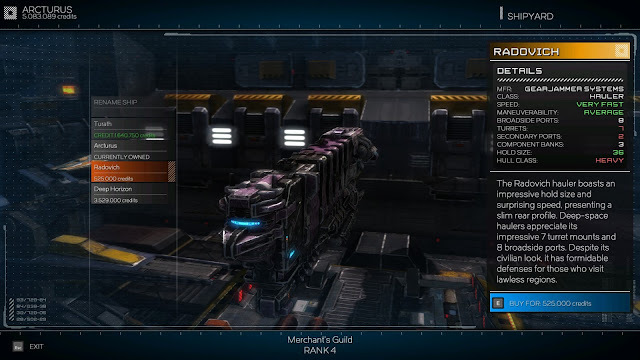 Heavier hull cladding, a large hold and high maneuverability make this a unique offering. 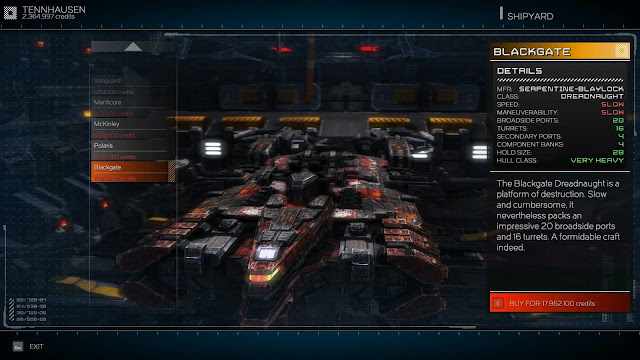 The Dravius heavy frigate has a unique vertically aligned broadside placement and 6 turret mounts as well as a spacious hold. Surprising maneuverability and extra hull plating give it a defensive edge. The Vanguard is commonly seen in Militia service, a sturdy and reliable craft. Aft cargo expansions make it excellent shipping vessel. The Turret emplacements are concentrated to the fore, a signature of the line. 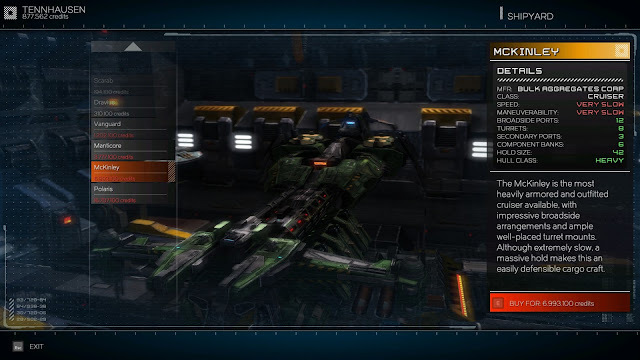 The Manticore is a well-armored destroyer with densely clustered turrets, and closely positioned broadsides. While not exceptionally nimble its grace belies its looks and four secondary ports add significant weapons options. The McKinley is the most heavily armored and outfitted cruiser available with impressive broadside arrangements and ample well-placed turrets mounts. Although extremely slow a massive hold makes this an easily defensible cargo craft. 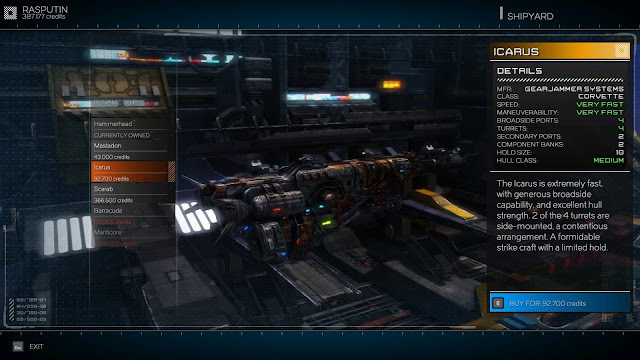 The Polaris is touted as the most maneuverability dreadnaught class vessel available. Commonly known as "Luck-13" due to the number of broadside and turret mounts it features, it has a moderate hold capacity for craft of this size. The Backgate Dreadnaught is a platform of destruction. Slow and cumbersome. It nevertheless packs and impressive 20 broadside ports and 16 turrets. A formidable craft indeed. The Arcturus class destroyer was designed for military use with heavy armor, nine turret mounts and eight broadside ports. This civilian edition is in high demand with mercenary corporations. The Sorcerer-class Dreadnaught is a veritable fortress boasting extremely heavy armor, twelve turret mounts and fourteen broadside ports. It has limited maneuverability but its death-dealing potential obviates this short coming. The Turath is a favorite of Korian merchants and smugglers. While somewhat slow to turn and with awkward broadside placement it has excellent hold space, thick armor and generous turrets for a small craft. The Radovich hauler boasts an impressive hold size and surprising speed, presenting a slim rear profile. 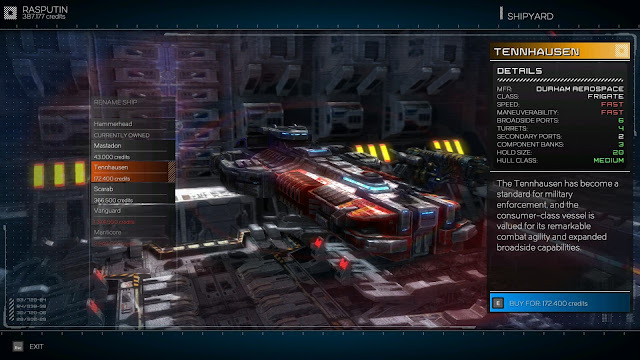 Deep-space haulers appreciate its impressive 7 turrets mounts and 8 broadside ports. Despite its civilian look, it has formidable defense for those who visit lawless regions. 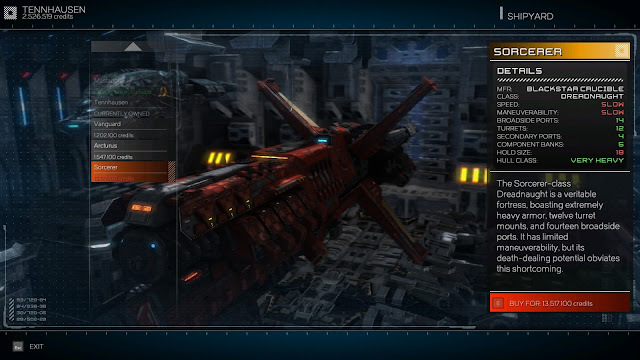 The Deep Horizon heavy hauler is tickly armored against attack with a sizeable hold and 10 turrets mounts. 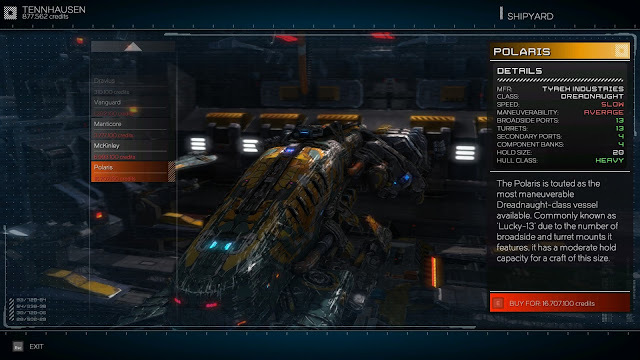 Excellent for traders who expect to endure heavy fire and reply on turrets for offense. The Sturville is swift and features excellent armament for such hull class, including six broadside ports and five turret mounts. While the hold size is moderate at best, This is an excellent choice for aspiring mercenaries. 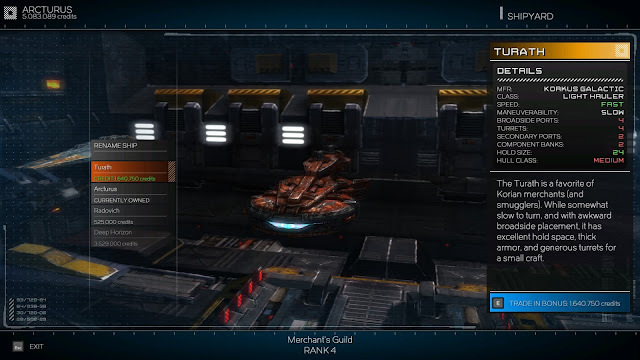 The Minotaur is one of the most maneuverable destroyer-class vessels available. 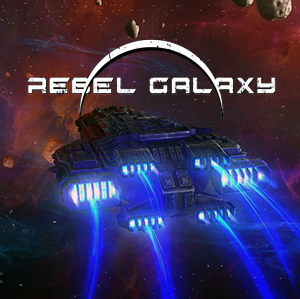 With a large hold and ample weaponry options, it is an excellent vessel for bounty hunters who don't shy away from heavy combat. It does sacrifice some hull strength in trade. The Barracuda is the fastest, most maneuverable ship in the quadrant, an excellent escape vessel. Hold size in moderate, but acceleration and speed are peerless. A highly capable string craft. 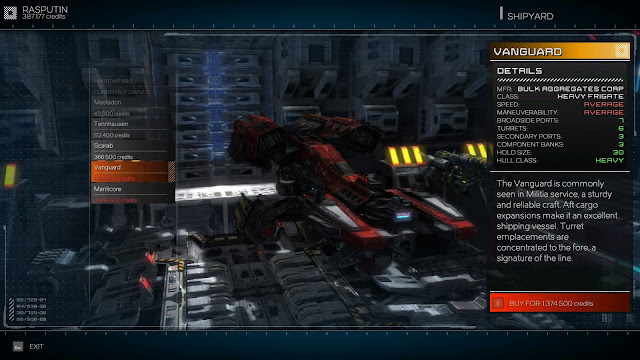 The Icarus is extremely fast with generous broadside capability and excellent hull strength. 2 of he 4 turrets are side mounted, a contentious arrangement. A formidable strike craft with a limited hold.